Temperature, oxygen, and food availability directly affect marine life. 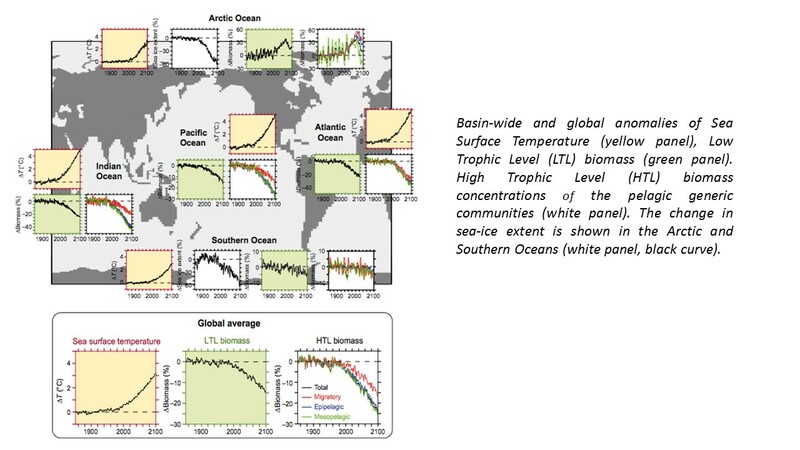 Climate models project a global warming of the ocean’s surface (~+3 °C), a de-oxygenation of the ocean’s interior (±3%) and a decrease in total marine net primary production (±8%) under the “business as usual” climate change scenario (RCP8.5). We studied the effects of such changes on biological communities using a coupled biogeochemical (PISCES)-ecosystems (APECOSM) model forced by the physical outputs of the last generation of the IPSL-CM Earth System Model. This study was performed with the APECOSM model. APECOSM is a size-structured bio-energetic model that simulates the 3D dynamical distributions of three interactive pelagic communities (epipelagic, mesopelagic, and migratory) under the effects of multiple environmental factors. The PISCES-APECOSM model ran from 1850 to 2100 under historical forcing followed by RCP8.5. The RCP8.5-based simulation highlights significant changes in the spatial distribution, biomass, and maximum body size of the simulated pelagic communities. Biomass and maximum body size increase at high latitudes over the course of the century. This reflects the capacity of marine organisms to respond to the appearance of new suitable environments. At low- and mid-latitude, biomass and maximum body-size strongly decrease. In those regions, large organisms cannot maintain their high metabolic needs because of limited and declining food availability. This resource reduction enhances the competition and modifies the biomass distribution among and within the three communities: the proportion of small organisms increases in the three communities and the migrant community, which initially comprised a higher proportion of small organisms, is favored. The greater resilience of small sized organisms resides in their capacity to fulfill their metabolic needs under reduced energy supply and is further favored by the release of predation pressure due to the decline of large organisms. These results suggest that small body-size organisms might be more resilient to climate change than large ones.